The N97 is a great effort from Nokia with a solid chassis and a nice range of features. However, we can't help but feel that the phone has far too much unfulfilled potential for the concept. It might have been all about the likes of Android and Apple with the HTC Magic or the Apple iPhone 3G / iPhone 3GS over the last year or so, but it's important we don't forget that Nokia is still top of the pile, and has sought to maintain that lead by bringing out another flagship handset, so we bring you the Nokia N97 review. The N97 is essentially laid out to be a mini-UMPC, with a slide out screen nestling at a roughly 40 degree angle on top of a full QWERTY keyboard. Sliding it up and down feels solid and very satisfying; in fact, it's easy to see that a few people will probably end up breaking the N97's screen as they'll simply be idly flipping it up and down all the time. Even still, it feels like it would be a while before you did that with the Nokia N97, such is its build quality. The chrome rim around the whole handset is a nice (if fingerprint attracting) touch, and the whole thing feels solid and stable in the hand, and the massive internal 32GB memory (which can be supplemented up to 64GB with a microSD card) gave us the feeling we had a powerhouse on our hands. 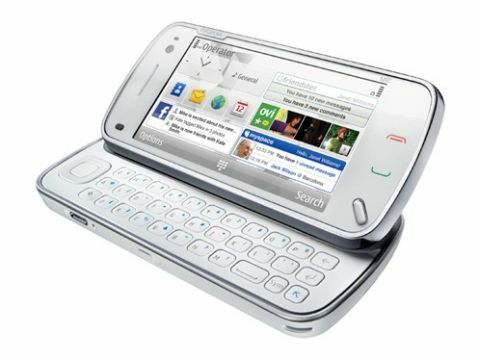 It's obviously going to be once again compared to the likes of RIM's general BlackBerry range (despite Nokia's extensive E-series competition) thanks to the keyboard, as well as the Apple iPhone 3G and the HTC Magic, just by the fact that it's a high end touchscreen device with a QWERTY input. In fairness, it's probably more iPhone than BlackBerry, as it clearly doesn't have email at the heart, but is more to fulfil the needs of the consumer who likes to message a fair bit as well as multi-task. It seems a little chunky, which is strange considering it's only 15.9mm thick. You obviously have to accept a fair amount of depth to the handset if you're after a QWERTY keyboard, but there's a notion that this still feels a little large and creates something of a protrusion from the average pocket. The lock key is a slider on the left hand side of the phone, which quickly brings the phone in and out of sleep mode, and is one of the better options we've seen to do so, especially as it gives a satisfying buzz when activating and deactivating. We're certainly very glad that Nokia has made the clever decision to add a 3.5mm headphone jack onto the phone, especially with the depth that's just been mentioned giving it no excuse not to get the drill out. It's well placed at the top of the device, although being further to the right or left would probably have made it more comfortable in the hand. In the box there are the usual suspects, albeit devoid of the 3.5mm adaptor, which is a lovely reminder that you're not going to have to fork out for loads of replacements in the future. The new charger with the USB connector is obviously included but if you're like most others on the planet you'll have around 50 legacy Nokia chargers and there's an adaptor for both the old and the older chargers in the box too, which is a really nice touch. Talking of which Nokia's excellent hands free kit and less excellent headphones are included in the box, as well as a screen wiper for when you get your mucky paws all over the shiny and scratch-resistant touch screen.